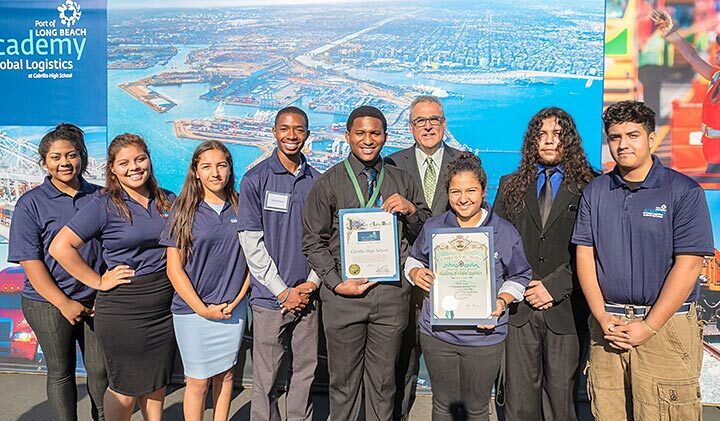 Cabrillo High School’s Port of Long Beach Academy of Global Logistics starts the school year as one of 68 academies joining a national network of scholars who will develop Android mobile apps and compete in an annual national app challenge. The Cabrillo academy is part of the Lenovo Scholar Network, which supports 118 academies and 5,000 students nationwide. The network helps to enable the next generation of developers and entrepreneurs through science, technology, engineering and math (STEM) education. Working with the Massachusetts Institute of Technology App Inventor, available at appinventor.mit.edu, now part of the MIT Computer Science and Artificial Intelligence Lab, Lenovo Scholar Network students have the chance to develop Android mobile apps using Lenovo devices. Lenovo is a leading producer of personal computers, smartphones and tablets. Lenovo and the National Academy Foundation (NAF) created the Mobile App Development Competition in 2014 to encourage greater interest among underserved high school students in STEM subjects, while providing them with entrepreneurial and technology skills needed to pursue careers in computer science, programming and engineering. NAF and MIT collaborate to provide technical assistance to Lenovo Scholar Network participants, and to develop support materials for teachers using MIT App Inventor. New partnership benefits include allowing students to earn certification credit, part of Lenovo’s commitment as a hiring partner. Cabrillo High School is part of NAF, a national network of education, business and community leaders who work together to ensure that high school students are ready for college and careers. In 2016, NAF academies reported that 96 percent of seniors graduated and most continued their education. Learn more at lenovoscholars.com or check out the #LenovoScholars hashtag on social media. GLOBAL SCHOLARS – Students celebrate last year's launch of the Port of Long Beach Global Logistics Academy at Cabrillo High School. The program starts the new school year as one of 68 academies joining a national network of scholars, tapping into the expertise of leading tech experts and university resources.